The leaders of a medical center and foundation think globally — and act globally. 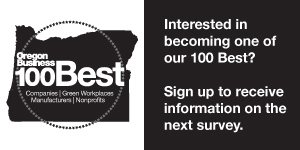 A list of staffing agencies ranked by full-time staff in Oregon and Southwest Washington. Gig economy and young workers force changes in staffing industry. Our annual ranking of the state’s privately held companies. As the feds waffle on health care policy, employers take charge. We dive into the wonky world of private-sector insurance plans and the booming business of wellness programming. Portland International Airport ups the ante with 14 new Portland brands, Hollywood Theatre and Blue Star Donuts included.